A French composer born October 28, 1961 in Valenciennes. A pupil of Ivo Malec, Betsy Jolas and Gérard Grisey at the Paris Conservatory, François Paris won a First Prize for composition and was then a laureate of the International Besançon Competition for La chair de l'aube (1992). In residence at the Villa Medici (1993-1995), he subsequently obtained a CA teaching degree for music school direction. Director of the CIRM and the festival Manca, he taught composition and made regular appearances in France (Fondation Royaumont, Nice Conservatory) and also abroad (Berkeley in California, Moscow Conservatory, Peking University, Shanghai Conservatory). His works, for varied groupings and genres, form part of his research into anamorphosis and new temperaments: L’empreinte du cygne, a double concerto for cello, piano and orchestra, first performed at the Festival Présences by Florian Lauridon, Dimitri Vassilakis and the Orchestre Philharmonique de Radio France (2001); Settembre, commissioned by the French State and premiered by the ensemble L’Itinéraire (2010). François Paris is also interested in the relationship between the visual and the aural: A propos de Nice, first performed by the ensemble Sillages (2005); Les arpenteurs, ballet music first performed by the Percussions de Strasbourg (2007). Through a cycle of independent works (La chair de l’aube for orchestra, 1992; Murs for voice and ensemble, 1993; Les confessions silencieuses for voice and ensemble, 1996), François Paris worked on the experiments and various elements that led to his opera Maria Republica, commissioned by Angers Nantes Opera (2016). He deepened his experience of music theatre with Le cas Jekyll, a chamber opera commissioned by Arcal (2018). François Paris was born in 1961 in Valenciennes. After studying at the Versailles Regional Conservatory, where he won a Gold Medal for musical analysis in 1982, he studied conducting with Jean-Claude Hartemann in Évry, first at the Agora cultural centre then at the École Nationale de Musique (1984-1990). He subsequently conducted his own works at the Maison de Radio France and at the international meetings in Darmstadt. At the Paris Conservatory (1989-1993) he followed the analysis classes of Betsy Jolas, the composition classes of Ivo Malec and the composition and orchestration classes of Gérard Grisey. With a First Prize for composition from the Paris Conservatory, he was a laureate of the International Besançon Competition for his orchestral work La chair de l'aube. From October 1993 to April 1995 he was in residence at the Villa Medici in Rome. On his return he was several times substitute teacher for musical analysis at the Paris Conservatory and obtained, in January 1997, a teaching CA for directing music schools. In 1999 he was a laureate of the Villa Medici Fuori-i-muri competition of the AFAA (Association Française d'Action Artistique) by which he was in residence in Asturia, Spain, where he composed Sombra for violin. In 2001 he received the Claude Arrieu Prize from the Sacem. No less a driving force in musical life, François Paris was a member of the artistic committee of L’Itinéraire then of the ensemble’s administrative board (1993). 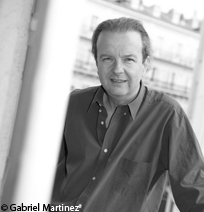 In 1996 he was elected vice-president of the French section of the ISCM (International Society for Contemporary Music). In Sarcelles, from 1997 to 2000, he was successively director of music and dance and director of the municipal music school (EMMA). He was subsequently director of the CIRM, the national centre for music creation in Nice, and of the Manca festival. As a pedagogue he has regularly taught or led seminars in various institutions both in France and elsewhere, notably at the University of Berkeley (California), the Domaine Forget in Quebec, the Fondation Royaumont and the Tchaikovsky Conservatory in Moscow. In 2004 he was appointed honorary professor of composition at the Capital Normal University in Peking and then, in 2006, composition teacher at the American Conservatory in Fontainebleau and, from 2010, instrumental composition teacher at the Nice Conservatory. Since 2011 he has also taught composition at the Shanghai Conservatory for sixty days a year as part of the Chinese programme “Oversea master project”. Paris’s works have been commissioned by various national and international institutions, notably Ircam, the ensemble L’Itinéraire, Radio France, Nuova Arca, La Filature de Mulhouse, and he has received commissions from the French state. They are regularly performed both in France and abroad, his catalogue including works for all groupings and all genres, with exception of the purely electro-acoustic. François Paris is of that generation of composers who were completely free of the weight of serialism; his attitude towards composing is marked by permanent questioning of the key ideas of material and form. The elaboration of sound matter for him necessarily implies anamorphosis, i.e. the systematic intrusion of instability, variation, transformation of any temperament, any spectrum, any figure, while retaining the audible contours and the easily recognisable intrinsic characteristics that are obligatory factors of coherence. The composer’s investigation of temperament began in 1991 with L’octobre seul for two clarinets, harp, violin and cello. L'empreinte du cygne, a double concerto for cello, piano and orchestra in memory of Gérard Grisey (1998), is entirely written in a temperament that is different from the classical and also uses micro-intervals. Paris seeks to establish functional relationships between melody and harmony, new vertical-horizontal compromises. Similarly, the simultaneous or alternating use of several temperaments in Settembre for instrumental ensemble (2009) means he can explore new harmonic, formal and melodic fields. Interested in the issue of anamorphosis, he has experimented with new developments in Senza for six percussionists (2005). This work is based on absence and is also the first for which he was not able to collaborate on matters of aesthetics, poetics or technique with his friend Fausto Romitelli, who died in 2004. Apart from his exploration of anamorphosis and temperaments, Paris undertook the composition of a cycle of works for voice and instrumental ensemble in which each piece, autonomous in itself, was incorporated into the cycle in order, and, lastly, could be subsumed into an opera. Les confessions silencieuses (1996) is the third part of this cycle, after La chair de l'aube (1992) for orchestra and Murs (1993) for four voices and instrumental ensemble. This work, based on the novel Maria Republica by Agustin Gomez-Arcos, concludes the first act of the opera in the pre-established sequence. More recently, François Paris has focussed on a cycle of works concerning seeing and hearing, “listening to seeing”. These are works associating music with a visual artistic idea. À propos de Nice for instrumental ensemble (2005) consists of an imaginary dialogue between the composer’s music and the eponymous work of the film director Jean Vigo. This initial relationship with the visual encouraged him to translate or comment upon what is visible in connection with what is heard. He continued this approach in Les arpenteurs for six percussionists, seven dancers and electronics (2007). This stage work, devised in collaboration with the choreographer Michèle Noiret, is the result of a group of propositions and counter-propositions, the music having no priority of existence over the dance and vice versa. The visual result of this collaboration, in Paris’s words, is “dance-cinema”. Finally, in 2008, with Éléments de vocabulaire pour dire, peut-être, quelque chose de simple et de doux for 12 mixed voices, the composer took the title of a work by the French visual artiste Martial Raysse. The creators shared the same exploration of a personal language, a new expressive vocabulary, the importance of which lay not in the techniques but the use made of them. PARIS François. Derrière le spectre, la série et les guilis-guilis. Doce notas preliminares, 1997, no 1, p. 151-159. PARIS François. Narrativité musicale : le miroir des signes détournés, l'image des phrases déployées. Rue Descartes, 1998, no 21, p. 115-122. Numéro intitulé « Musique, affects et narrativité ». PARIS François. Le jeu de loi. In : La loi musicale : ce que la lecture de l'histoire nous (dés)apprend / textes réunis et présentés par Danielle Cohen-Levinas. Paris : l'Harmattan, 1999, p. 41-48. PARIS François. Le temps de l'opéra. In : Causerie sur la musique : entretiens avec des compositeurs / Danielle Cohen-Levinas. Paris : l'Harmattan, 1999, p. 181-202.